Working with you to remove the barriers that stop you from realising your full potential. Throughout the previous articles on Why Attitude Matters, there have been regular references of how your attitude can affect you and those around you. If your peer group is stocked full of negative individuals who continually paint life in a negative light, that will naturally impact your attitude as we can be influenced by the things going on around us. 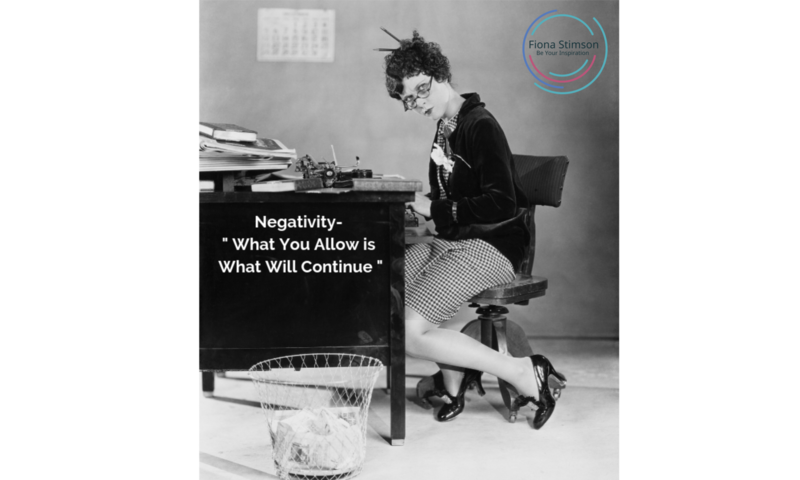 Generally, the negativity is caused by fear and rather than feed it, you can take positive action to either remove yourself from it or understand it and take action. It is your responsibility to do something about it (for yourself) so it does not impact on your physical and mental health, so ultimately, you can make the choice of totally removing yourself from the negative influences or thinking about how you can handle these situations in a more positive manner. An all too easy, but unproductive way of dealing with negative people is to give them the respect, love and control they crave. This is a slippery slope, as negative people generally adapt to the new levels of respect, love and control they crave and therefore up the stakes, you may find yourself having to continually provide more and more to keep them happy which ultimately will be destructive to your own well being. The alternative is to make the negative people in your life to see the source of their unhappiness and that it has to do with their attitude rather than the general state of the world. Often, this can fall on deaf ears, as those who tend to be negative may not open to constructive criticism and therefore will not accept the feedback. Are you the negative person here? Think about this and how you interact with others. What can you do to take the first steps to change? Generally, the options are to grit your teeth and keep putting up with it at the expense of your own well being, seek the help of a third party as a sort of arbitrator, or to provide compassion for the negative person, whilst taking responsibility for your own happiness. The biggest and the best thing you can do is to choose how to respond, instead of reacting. Reacting is where your instincts take over, and you let all of those negative emotions that are built up inside of you pour out. The trouble with reacting is that you don’t have time to acknowledge the consequences of your actions, so it can make things ten times worse. When you respond, you give yourself time to think, remain calm and assess what will happen. In that case, you can deal with the facts rather than the emotions. What I mean by that is, instead of focusing on all the emotions that are both in the air and developing inside your head, focus on the details of the situation, be factual and secure in your own needs. If you start to let the negativity get inside your head, your attitude will plummet and that’s when your happiness and behaviour will start to decrease. For example, if a work colleague is continually undermining you and telling you that your strategy will not work, you may want to shout, scream and give them a piece of your mind. But what will that achieve? So, instead, listen to what they have to say, explain how your strategy would work, take on board any constructive points and then inform them that if it doesn’t work, you’ll find another solution. You have the ace card, you have control over YOUR attitude and therefore you can push forward to do the things that you need to make you happy. That means if people are shooting your ideas down for no good reason or not listening to your suggestions, you still have the power to adopt a positive attitude, respond calmly and be the bigger person. As with all these things you have to have the desire to change, if you take on board the suggestions within these articles then you will be making a great start to becoming more positive and managing your attitude or if you are already a positive person, to increase your positivity to amazing effect. Mostly, we get what we give, so by taking up the challenge to improve and develop yourself as much as possible, you will experience the universal rewards. If you would like to work on improving a negative attitude and becoming more resilient then please do contact me for your complimentary consultation.